Although technically his second journey, The Global Poverty Walk was the first of the grueling long-distance walks undertaken by Anti-Poverty Advocate and extreme adventurer Matt Napier to raise awareness of global poverty. Starting in Perth on 2 February 2013, Matt walked across the Nullarbor, through Adelaide, Melbourne and Canberra before finishing at Circular Quay in Sydney on 30 June 2013 – covering a distance of 4,501km in just under 5 months. Matt, a mad AFL fan, walked the entire route, bouncing an AFL football – something that has never been done before. People say that walking from Perth to Sydney is a long way and it is, but if everyone in Australia took one step on that route it would be pretty easy. It’s the same to end world poverty – one person or country can’t do it on their own but if we all do our little bit we can create history and be a part of the generation that ends world poverty once and for all. 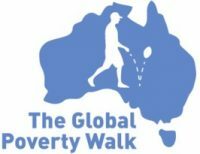 The Global Poverty Walk was organised in partnership with the Make Poverty History campaign and supported by the Federal Sports Minister Senator Kate Lundy, the NEAFL and AFL ACT/NSW aswell as dozens of sponsors. Click here for photos from the Global Poverty Walk. Over 130 media outlets reported on Matt’s journey. Click here for details.